There will be four stories in total, and we start with the story of Ruth Quaye, which was originally published by YPARD in November, 2014. “Story captured by Miriam Hird-Younger, as part of the series “Investing in Youth in Agriculture – Engineers Without Borders Canada (EWB) in Ghana.” This Wednesday, this AgEx Venture Leader brings to us the success story of Ruth Quaye, a Ghanaian youth champion who participated in the EWB support Agribusiness and Entrepreneurship Project, building her understanding of how to start and run a business. An FAO and ILO study in 2009 indicates that 40% of all unemployed worldwide are between the ages of 15 and 24. At Ghana’s agricultural colleges, graduates used to be guaranteed jobs with the Ministry of Food and Agriculture as Extension Agents, supporting the country’s farmers. Now, only a small minority are able to access public sector jobs. The rest have to find other means, and it can be discouraging, frustrating and difficult. The inputs to get started in the civil society or private sectors are not easily accessible. Credit to start a business is hard to get, and interest rates can be unbearable. Higher management jobs often require a degree. Agricultural college graduates are trained in the practical, technical and field level competencies for the agricultural sector. But it’s not obvious how to place yourself in the system to play that role. Ruth Quaye graduated from Ejura Agricultural College in 2012. She had hoped to work for the Ministry of Food and Agriculture when she graduated, but was faced with the situation of many of her fellow youth – employment options were limited and competition was fierce for the jobs that existed. She notes that employment for youth in agriculture is a big problem in Ghana. During her time at the college, she participated in the EWB support Agribusiness and Entrepreneurship Project, building her understanding of how to start and run a business. The course-based project does not given any funding for students to start their businesses. Instead, students are encouraged to use their own resources to start small and grow their businesses with the profits from initial investments. Some students start their businesses with as little as 50GHS (15USD).The project doesn’t provide funding for the students’ businesses in order to demonstrate that you don’t need to wait for a thousand dollar loan to start a business, but can use the resources already within their reach and build up from there. Ruth’s student group developed a quality and hygienically packaged shito (a popular Ghanaian fish, cooked with pepper and tomato sauce). They sold the product at the popular weekly market in Ejura, where consumers and sellers from all nearby communities came to do business. Ruth reflects on her first attempt at business: “Before the project I was not having knowledge on marketing and how to do something on our own. Through the project I learned that I can do something on my own without depending on others.” She noted that it was not an easy process. She had a lot to learn about how to get customers and had challenges growing the business. Ruth now works in a private agribusiness that distributes agricultural inputs and products, such as fertilizer and pesticides, acting as the company`s agronomist. This young Ghanaian is still interested in also having her own business, but finds it challenging to start. With capital scarce in the system, it is especially hard for youth to access start-up capital. Although getting started in agriculture as a young person in Ghana can seem daunting and discouraging, with capital hard to access and a lot to learn about business marketing, the private sector in agriculture is constantly growing in Ghana and opportunities abound. 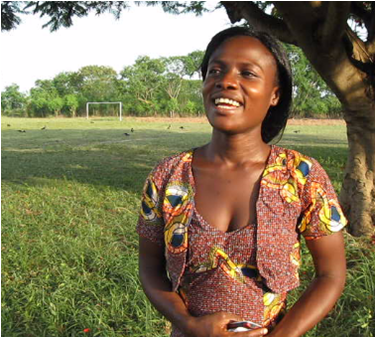 Youth can seek out employment in agribusinesses like Ruth has done, or start their own. If youth are able to start small, to look at what is already within their reach, they can begin to create their own opportunities rather than waiting for opportunities to come to them. **Blog post originally published by YPARD in November, 2014. From our 11 year old history, here are a selection of stories of those who have been impacted by the work of EWB’s AgEx Venture in Ghana. Some are farmers, some are students, some are our institutional partners and some are our own staff and fellows. We are proud to share a peek into our impact with these stories. For more on AgEx, check out this 10 year anniversary booklet! As a Junior Fellow in 2010, I worked on establishing the Agriculture as a Business (AAB) curriculum as a regular activity of the Ministry of Food and Agriculture in the Kassena-Nankana East District (Upper East Region, Ghana). I trained extension agents in the inner workings of the curriculum, going out to the field to coach them through its implementation and working with management to build buy-in to the program. Even with this investment, due to other competing priorities at the district, AAB didn’t become a permanent program at the district. This does not mean, however, that the program didn’t have impact. In 2011, I revisited a women’s group of about 60 members that participated in AAB in 2010. Before AAB, they had never engaged in farming as a business before. Through our work with AAB, Eddy (Extension Agent extraordinaire) spent weeks investing in their knowledge, skills, and motivation. We planned a meeting between the group and a local rice processor, and the District Director even came to the meeting and the follow-up meeting with the group back in their village. A year later, their level of self-confidence as a group had soared because they had been invested in. They had all doubled the size of their farms and they expressed a self-belief and determination they hadn’t before. Nobody had seriously invested in these women before AAB, then suddenly they were getting the attention of the Extension Agent, the Director, and buyers. With EWB, we look to change systems, but sometimes we overlook and undervalue the less systemic, but more individual and human impacts of our efforts. If we dig into our failures a bit deeper, we might uncover real impact like the change lives of 60 female farmers in Kassena-Nanakana. “[My A&E] project was about commercialising pop-corn to feed its lovers as well as earn some income. The brand name of the product was “Armor Pop-Corn”, a combination of corn, groundnut and other ingredients well labelled. Knowing and understanding how to work with people in a group towards innovating a product, marketing it and making it successful. My [National Competition] project was about turning cassava peels into animal feed. The product name was “Ultimate Cassava Peel Meal” – an alternative feed source that is full of energy and other essential nutrients for animals. [Winning the National Competition] was a humbling feeling; the kind that ignites excitement as well as responsibility. Excitement in the sense that it was the first time that people from the school had been adjudged the winner of a competition of that nature and I was privileged to have been a part of that. It was also a responsibility because that honour served as a benchmark that will be used to measure me and my entrepreneurial ability in future endeavours. What it then means is that anything I do after that award has to be of class else I will be making mockery of the honour done me by the organisers of the competition. “When not working with EWB, the planning wasn’t there. Before we do something, didn’t know how to plan. Now we know how to plan out our farming projects. Initially, when we were doing something, we didn’t take much time to look at the start and what the end will be. Don’t even sit down to see what you were investing. What should be used for labour, inputs, all that. Just used to get up and do it and think we would gain. Meanwhile it was a great loss. Now, start projects with planning. Get to know how to get profit and loss. This was difficult before, we were not keeping records before. Now that I can keep records, I can see that maybe when I’m doing one crop, it won’t give me a loss but another will. Now I know what crops I can depend on. Meaghan worked with Team MoFA in Upper East Region of Ghana, working side-by-side with farmers, farmer groups, AEAs and MoFA staff on Agriculture as a Business, performance management within MoFA and a Market Information Systems project. Upon returning to Canada, Meghan saw a genuine opportunity to improve food systems in Canada. She founded Localize, a food labeling service for grocery stores which identifies where food comes from and which has a QR code which customers can use to find the full information set about where the food was produced, where the ownership is, and the narrative behind the ingredients and supply chains. “On behalf of the club I want to say a very big thank you for all the helps you and your group members offered to us. We shall always remember you and your team.We have have been able to open a bank account with Ghana commercial bank and we have been invited to take part in a couple leadership training with USAID IN Accra and in Koforidua recently. The new students who have recently been admitted at Damongo Agric are impressed by the initiative. The club have now gained much recognition and membership have more than tripled. At wenchi the club is embarking on a cow-pea project ;our land is cleared seeds are sown and about to flower. We are also planning to provide training in mushroom production for some selected communities in the Ashanti region in our next semester and raise poultry at Wenchi. The club wants to focus on providing readily employable skills to our members by sharing our practical skills with rural people in collaboration with NGOs that are ready to support us in such initiatives. AgEx is celebrating the leadership and vision of Principal K.F. Kontor, on his retirement from Kwadaso Agricultural College. 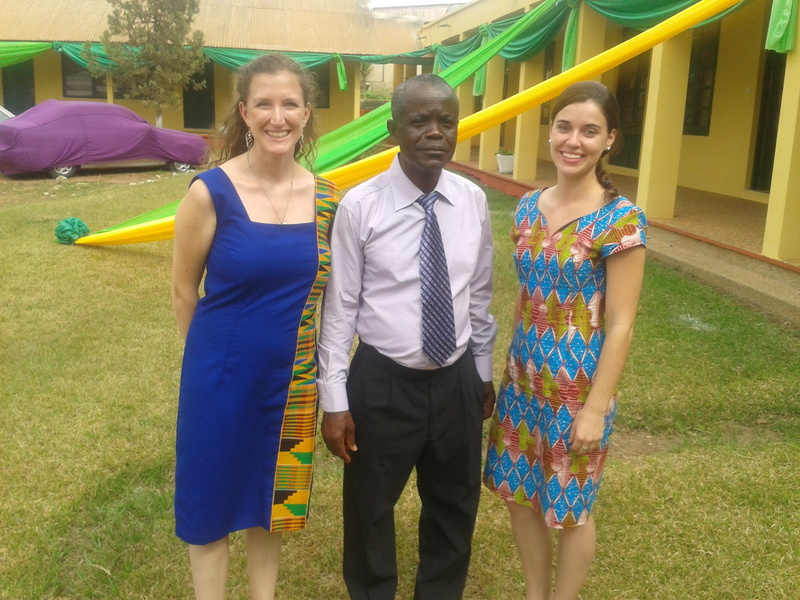 Principal Kontor’s partnership with EWB has supported AgEx’s work in transforming the education provided across Ghana’s agricultural colleges. Without the mutual trust, accountability, communication, feedback and support of this partnership, the Agribusiness and Entrepreneurship Project, Internal Attachment Program and Innovation Committee would not have been possible. Principal Kontor’s dedication to development has been inspiring for many EWBers over the years, and we wish him the best in his retirement. Personally, I have been privileged to work closely with Principal Kontor for the last three years and have been inspired by his drive, vision and ability to take risks – all key skills and qualities of a change agent. Within the sometimes frustrating and slow moving public service, Principal has dedicated 25 years. At KAC, he has been a visionary, holding dreams of what the college could become in terms of a systemic change institution in Ghana and bringing others into that vision. To the end, he has continued to try to institutionalize innovations on campus towards that vision. Principal‘s dedication to change goes beyond his work at the colleges to other parts of Ghana’s development process. He envisions a Ghana free of litter. You won’t find a stray water sachet on campus. On weekends, he will put on his wellington boots, take a wheelbarrow and pick up garbage along the road. Working towards this vision takes humility, the ability to continue to learn and dedicate extra upon extra hours to the cause. Principal Kontor’s leadership has enabled AgEx to work with the colleges to pilot innovations in student learning and training. Fore example, AgEx worked with KAC to pilot a new experiential learning opportunity that has young students learning about agriculture by actually living and working with farmers, a program that has since been scaled nationally to reach almost 500 students annually. Through his dedication to Ghana’s agricultural colleges, Principal Kontor has inspired generations of agriculturalists to take on the hard work, vision and humility that he has role modelled. Thank you Principal Kontor for your contribution to Ghana’s agricultural development.